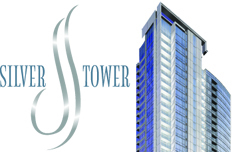 Silver Tower is a 229 unit high rise condominium building located in Chicago's River North community. It is a contemporary glass tower with amazing skyline views. Residents enjoy amenities such as 24 hour doorstaff, a fitness center and two outdoor terraces.